Rian Johnson’s The Last Jedi came out late last year and it sent shockwaves throughout the world of Star Wars fandom. Some fans loved it, some thought it was just oaky, and others completely hated it and have made their voices known on social media. Online trolls upset with the female representation in the film have done “fan” edits that remove all of the women from the movie and campaigns have been started to raise money to completely reshoot the entire thing. Even more extreme trolls drove Kelly Marie Tran from social media. Now, a group of clever fans have done an excellent parody of Rian Johnson’s Brick about the angry Star Wars fans. 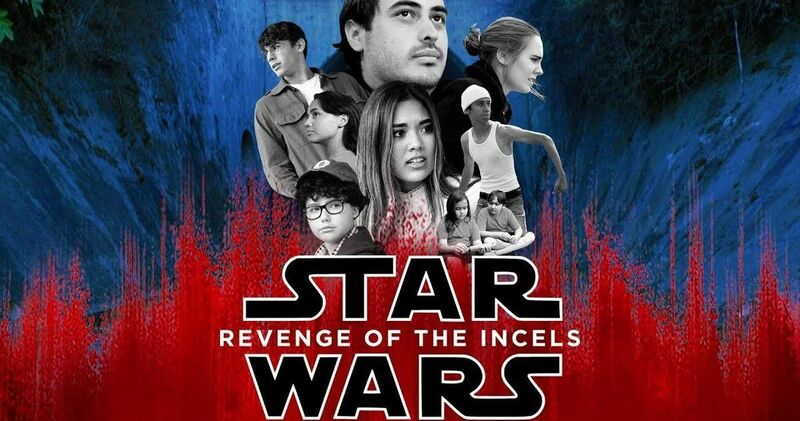 The Brick parody is titled Revenge of the Incels (incels blends the words involuntary and celibate) and was made by fans who are standing up for Kelly Marie Tran. The fan-made film takes aim at the Star Wars trolls that drove Tran off of social media because of her role inThe Last Jedi and it’s a pretty spot-on parody of Brick in the process. J.J. Abrams and Lucasfilm president Kathleen Kennedy are all represented in the film as well, playing off of fan stereotypes for extra comedy. In addition to J.J. Abrams and Kathleen Kennedy, former Solo: A Star Wars Story directors Phil Lord and Chris Miller are also spoofed in this Star Wars fan-made movie, mocking their online personalities and playing off of fan rumors and reports. The Rian Johnson character is even seen asking Lord and Miller if they’ve seen Solo, which results in a dual single finger salute. The film is a perfect blend of poking fun of everything that some fans take way too seriously. All of the hate for The Last Jedi spilled over into the Solo movie as well, which is referenced in the fan-made movie that supports Rian Johnson and Kelly Marie Tran. Everything from the Boba Fett movie to Porgs and Captain Phasma are reduced to comedy, highlighting the silly arguments that get made online daily. The troll support of a new version of The Last Jedi that will never happen, no matter how many people complain about it online, is pretty ridiculous and highlighted here. The anti-hate Star Wars fan-made film is especially perfect for people who have seen Brick. The parody is really well done and deserves to be watched for that reason alone. It’s important to note that while this movie is clearly against the toxic fandom of the franchise, it also makes good criticisms as well, without getting negative. In other words, it’s pretty balanced, listening to constructive criticism of The Last Jedi, while trimming out the trolls and poking some fun at them. The fan-made Star WarsBrick parody is 15 minutes long and a worthy watch for anybody that is even just a little bit aware of the toxic franchise fandom. Check out the entire movie below, thanks to DanaJamesJones’ YouTube channel.